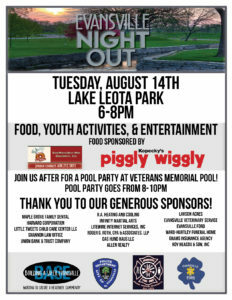 Evansville Night Out 2018 | Building A Safer Evansville, Inc.
Evansville Night Out will take place Tuesday, August 14, 2018 from 6 – 8 p.m. at Lake Leota Park in Evansville, with a pool party afterwards from 8-10 p.m at Veterans Memorial Pool. This event is a coordinated effort by BASE, Evansville EMS, Evansville Police and Evansville Fire. The purpose of this event is twofold; to provide an inexpensive, safe, alcohol free event for families and to showcase the Public Safety Agencies that we have here in Evansville. The event will include demonstrations by all of our local Public Safety agencies and Rock County SWAT, Mercy React will be landing their helicopter, bouncy houses, raffle prizes (THIS YEAR YOU MUST BE PRESENT TO WIN), a petting zoo, games, Cops and Bobbers and much much more! NEW THIS YEAR the Madison Log Rollers will perform and you can have the chance to try out log rolling!